The global algae market is developing at a gradual pace around the world, with a number of algae oil production facilities yet to be fully commercialized. Growing concerns regarding the emission of greenhouse gases have driven the adoption of renewable energy sources, algae being a prominent one. Apart from a rising demand for algae-based biofuels in road, marine, and aviation applications, the plastics industry has also upped its demand for algae to produce biodegradable plastics. The global algae market was valued at US$608.0 mn in 2015 and is projected to reach US$1.1 bn by 2024, at a CAGR of 7.39% therein. In terms of volume, the market is poised to expand at a 5.32% CAGR between 2016 and 2024. In terms of cultivation technology, the algae market has been classified into open ponds cultivation technology, raceway ponds cultivation technology, closed photo bio-reactors, and closed fermenter systems. On a global scale, more than 80% of algal biomass is generated through open pond cultivation technology. Open pond cultivation systems require low investment and as a result are utilized on a larger scale. However, in recent years, established players such as Algae Tec and Solazyme, Inc. have been investing more on emerging cultivation technologies such as closed photo bioreactors and fermenter systems for better productivity under the close monitoring of automated systems. Closed photo bio-reactors are an emerging technology used to promote biological growth by controlling environmental parameters such as light. The only disadvantages presented by this technology are high capital costs and long payback periods. In terms of geography, the global algae market comprises North America, Europe, Asia Pacific, the Middle East and Africa, and Latin America. In 2015, North America led the global algae market. Countries such as the U.S., Canada, and Mexico house more than 135 companies engaged in algae cultivation and this is a key factor driving the algae market in the region. The North America algae market is single-handedly driven by the U.S., constituting around 86.4% of the market by volume and around 87.6% by value in 2016. The U.S. is anticipated to dominate the algae market through 2024 thanks to the expansion of production facilities and efforts to overcome the demand-supply gap. The North America algae market is considerably more mature than other regional markets such as Europe, Asia Pacific, Latin America, and MEA. Countries in Asia Pacific are focusing on algal biotechnology in wastewater bioremediation and CO2 capture and utilization. Asia Pacific hosts five of the top 10 carbon emitters in the world –India, China, Japan, Indonesia, and Iran – who contribute to more than 40% of the global emissions. Strong movements are under way to fully commercialize the production of biofuels from algae. Currently, more than 50% of the algae produced through various cultivation technologies are utilized in DHA production to manufacture chemical components for medicines, health foods, cosmetics, and food additives. Key players in the global algae market include Algae Tec, Pond Biofuels Incorporated, LiveFuels, Inc., Algae Systems LLC, Sapphire Energy, Inc., Solazyme, Inc., Diversified Energy Corporation, Algenol, Kai BioEnergy Corp., Algix, DSM Nutritional Products, Dao Energy, LLC, Phycal LLC, and Kent BioEnergy Corporation. This research study analyzes the market for algae in terms of revenue (US$ Mn) and volume (tons). The algae market has been segmented on the basis of application, cultivation technology, and geography. The geographical segmentation includes regions, which are further divided into 15 countries. The report features a detailed regional segmentation with market growth forecasts for the years from 2016 to 2024. 2015 has been considered the base year and 2016 the estimated year, while all forecasts have been given for the period from 2016 to 2024. Market data for all the segments has been provided at the regional and country-specific levels from 2016 to 2024. The report provides a broad competitive analysis of companies engaged in the development of algae cultivation technologies. The report also includes key market dynamics such as the drivers, restraints, and opportunities affecting the global algae market. These are analyzed in detail and illustrated in the report with supporting graphs and tables. The report also provides a comprehensive analysis of the market with the help of the Porter’s Five Forces Analysis model, which helps in understanding the factors that affect the structure and profitability of the global Algae market. These are the bargaining power of buyers, the bargaining power of suppliers, the threat of new entrants, the threat of substitutes, and the degree of competition. The high-level analysis in the report provides detailed insights into the algae business globally. There are currently numerous drivers for the market. The most prominent drivers include renewable energy growth, energy scarcity, and stringent government regulations to minimize carbon emissions. Market attractiveness analysis was carried out for the algae market on the basis of application, cultivation technology, region, and country. Market attractiveness was estimated on the basis of common parameters that directly impact the market. The algae cultivation process focuses on carbon capturing. These innovations have helped several companies involved in algae cultivation and production to generate funds from government and private investors. The governments of several countries are setting targets to minimize their carbon emissions leading to increased demand for algae-based products. Volatility in the supply and prices of crude resulting from geopolitical differences and varying demand from consumers further strengthens the possibility of using algae-based products. Blends of fossil fuels and algae-based biofuels are being utilized in the transportation sector to check the commercial viability of biofuels produced from algae. Full-scale biofuel commercialization requires robust investments on technological developments and more than ten times the expansion of existing production facilities. Minimizing the cost of end products such as jet fuel, kerosene, ethanol, and methanol manufactured from algal biomass is the primary concern. High growth of the algae-to-biofuel market is anticipated by 2035. The global algae market has been segmented into two categories: by application and by cultivation technology. 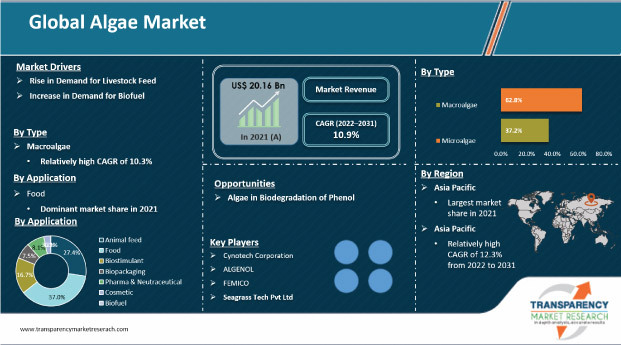 In terms of application, the algae market has been classified into marine sector, aviation sector, road transport, DHA production (protein sales), DHA production (pharmaceutical applications), bio-plastics, and others. In terms of cultivation technology, the algae market has been classified into open ponds cultivation technology, raceway ponds cultivation technology, closed Photo bioreactors, and closed fermenter systems cultivation technology. In terms of geography, the market has been segmented into five regions: North America, Asia Pacific, Europe, Middle East & Africa, and Latin America. The U.S. is expected to remain the dominant market for algae, with demand reaching 7,246.67 tons by 2024. The U.S., Canada, and Mexico have stringent environmental regulations. These regulation would result in wide scale adoption of green-energy based products and services. India is one of the fastest-growing economies in the world. Favorable government regulations and the emergence of medium and small enterprises in India have contributed significantly to the algae market. Major players in the algae market are Algae Tec, Pond Biofuels Incorporated, LiveFuels, Inc., Algae Systems LLC, Sapphire Energy, Inc., Solazyme, Inc., Diversified Energy Corporation, Algenol, Kai BioEnergy Corp., Algix, DSM Nutritional Products, Dao Energy, LLC, Phycal LLC, and Kent BioEnergy Corporation.